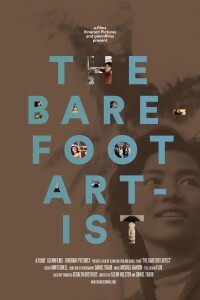 In “The Barefoot Artist,” Philadelphia-based artist Lily Yeh offers this description of her art: “The broken places are my canvas.” The documentary takes us to many such “broken places” transformed by Yeh’s work, from North Philadelphia—where empty lots and abandoned buildings have been converted into mosaics and gardens—to the slums of Korogocho, Kenya, to a memorial in Rwanda that Yeh designed to honor victims of the genocide. But Yeh’s most unique talent is not as a visual artist, but as a community-builder. These dazzling gardens of brightly painted concrete trees, murals, and fragments of colored tile are the handiwork of willing local volunteers who Yeh organizes and inspires—and often helps to heal. “Releasing our sadness” is how one Rwandan survivor describes the process of art making. To a wonderfully infectious score by Michael Aharon and powerful clips shot over several decades by filmmakers Daniel Traub and Glenn Holsten, Yeh seems to leap from continent to continent and through various stages of her life, as she tirelessly marshals the troops of beauty and renewal like some smiling, diminutive general. Like daughter, like father. Yeh’s father, we learn, was a general in Chiang Kai-Shek’s army known as much for his victories as for his concern for his troops’ wellbeing. And it is his story that takes us to one more “broken place” that Yeh must heal: her own family. It turns out that Yeh’s father had a first wife and several children who were left behind in China when the communists took power, and who suffered at the hands of Mao’s regime for their Nationalist connections. Yeh’s half siblings, deprived of the opportunities enjoyed by their father’s other children, have led lives as different from Yeh’s as have the villagers in Rwanda. Yeh takes it upon herself to bridge that gap, and the later portion of the film turns more and more towards scenes of meeting and reconciliation between Yeh and her newly discovered family. The camera lingers uncomfortably long on a tearful embrace between Yeh and her elderly half-sister: Yeh seems almost desperate to hold on to that precise moment where the broken pieces are reunited.